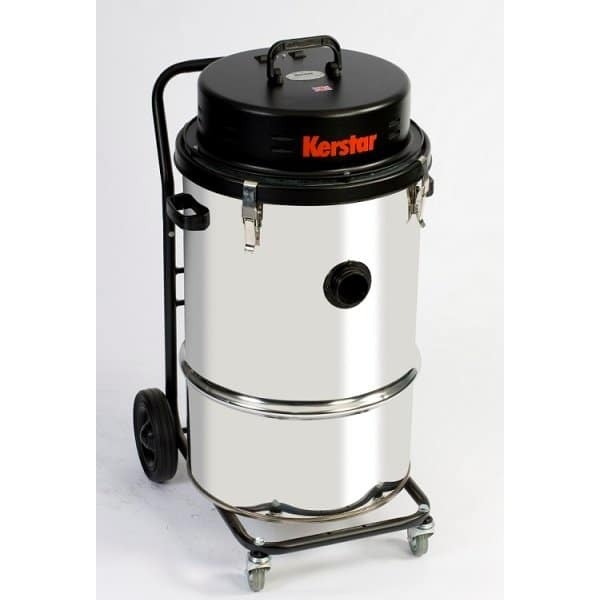 The Kerstar CV110/3 has an 88 litre canister capacity,and is a 3,000 watt dry industrial vacuum cleaner. The ultimate in heavy duty yet mobile industrial vacuum cleaners, using the most modern hard wearing materials and constructed for a long, trouble free working life. This range of machines is built around an 18 inch (455mm) heavy gauge high quality steel canister carried on a tough electrostatically coated tubular steel caddy. To ensure a long life and ease of movement even when full, the caddy is fitted with two large 200mm dia. rear wheels and two 75mm solid rubber tyred castors. The exceptional suction power of these machines is provided by either two or three 1,000 Watt bypass cooling vacuum motors of the very latest design, housed in a rigid steel electrostatically coated motor head. Each motor is switched individually so that the operator can select the amount of performance required.